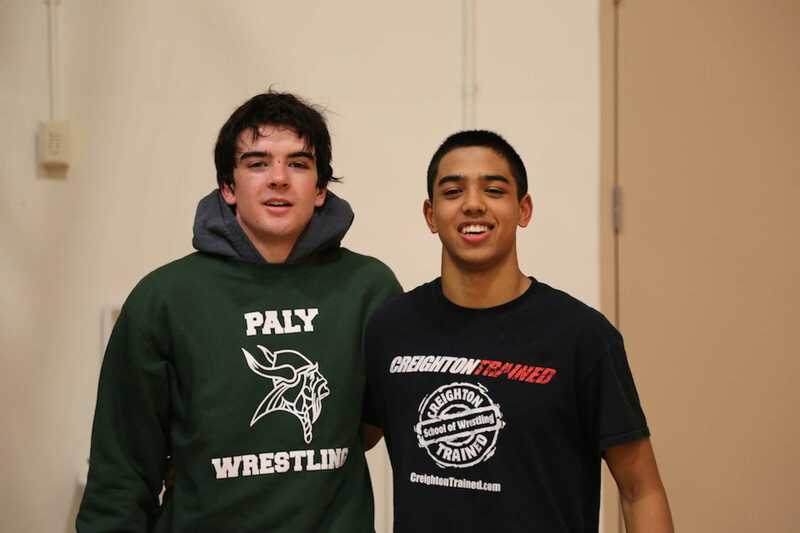 Paly wrestlers Seth Goyal ('17) and James Giaccia ('15) pose together after a meet. 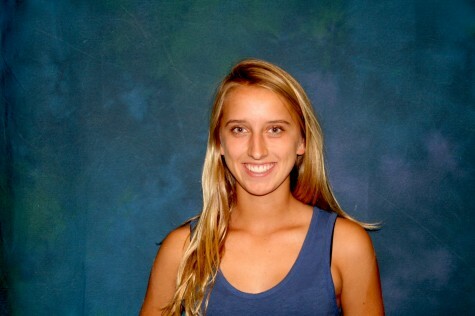 At Paly, some athletes have older siblings on their sports teams who they can look to for guidance and inspiration. These teammates share a last name and a bond that is unique from the relationships between other members of the team. Although wrestlers James Giaccia (‘15) and Seth Goyal (‘17) are not related, they do share a brotherly bond similar to that of true siblings. Giaccia was first introduced to the wrestling world by one of his older brothers, Nicholas Giaccia (‘08), and he soon became immersed in the community himself. Although Giaccia had an older sibling that went through the same experiences he was going through, Goyal didn’t have someone in his family to learn from. However, when Goyal met Giaccia when he was in middle school, things changed for the both of them. As they traveled together for training camps and wrestling matches, their relationship grew. Giaccia reflected on these experiences in a message he wrote to The Viking. One memory the two share is driving the long distance to Gilroy for a five-day wrestling camp, where various clinicians and college coaches came from around the country to teach different wrestling styles. Another experience the boys shared was being a part of the California State team together during the summer of 2014. Paly head coach Braumon Creighton believes that the two boys became especially close while training this past summer on the National team. “They’ve gotten tight. They spent a lot of time together over the summer. We went to the Olympic Training Center together this summer, we went to Fargo, we were all part of the California National Team, so they were on the team and I was one of the coaches. So that was a lot of time spent this summer training. Through all the experiences they have gone through together, Giaccia and Goyal have both gained a lot from one another. Although Giaccia has two older brothers, his relationship with Goyal has allowed him to see what being the ‘older brother’ is like. And for Goyal, he has gotten the brother he never had. Older brothers often act as role models to their siblings, and Giaccia fills this role in Goyal’s life. Although the two Paly wrestlers are now close friends, the two did not get along when they first met, according to Goyal’s sister Sabrina Goyal (‘15). By forming a strong connection, Giaccia and Goyal have helped one another through rough patches in their athletic careers. “Goyal has pushed me and has always been there to help me through tough times in wrestling,” Giacca wrote. The two have also helped each other improve in the physical aspects of the sport by mentoring each other on weight loss tips and skill improvement. Giaccia recounted a time when they both had to help one another lose weight before an upcoming tournament. According to Creighton, who has coached Giaccia since freshman year and Goyal since sixth grade, they help their other teammates as well as each other on the mat. Goyal’s encouragement in the weightroom and on the mat has not only enabled Giaccia to develop his wrestling skills, but it has also helped Giaccia to grow as an individual. When Giaccia graduates, Goyal will no longer have a partner to practice with, because the younger wrestlers on the team have differing weights and skill levels than him. “I won’t have a drill partner anymore because there is no one else my size at our skill level, so that is going to be kind of a problem after he graduates,” Goyal said. Creighton agrees that finding Goyal a new partner will be key in upcoming years. When Giaccia goes to American University next fall, he will miss the camaraderie of the Paly team that he is leaving behind. “I will miss the coaches and spending time with the guys on the team [next year],” Giaccia wrote. Creighton also admits that losing Giaccia will be difficult because of all that he brings to the team. As for the teammates Giaccia is leaving behind, he advises them to accept the obstacles that they face in upcoming years. “Embrace all the challenges that come with wrestling and the team and everything else in life,” Giaccia said. When Giaccia leaves for a new wrestling community, Goyal will be left to form connections with younger teammates. Both of them will move on to practice with other individuals, and although they may not see each other across the mat anymore, they will still have the lessons and experiences that they gained from one another. The pair may not be brothers by blood, but wrestling together has brought them closer to one another, and has also brought them closer to the sport that they love. 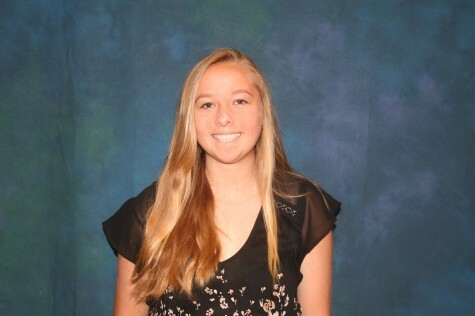 Katie Foug is now a senior and is on the varsity cross country, soccer and track and field team at Paly.